You are here: Home » An app that means I don’t hate Dublin Bus! Real-time bus times! An app that means I don’t hate Dublin Bus! Real-time bus times! I have thrown my fair share of colourful language at Dublin Bus over the years. Standing waiting 20, 30, 40 or 50 mins for buses that are supposed to be every 10 mins. Not knowing if I had just missed one and have an hour of waiting or if there is one just around the corner. The frustration and annoyance on time lost and trains missed on many an evening has often been enough to ruin an otherwise good day. 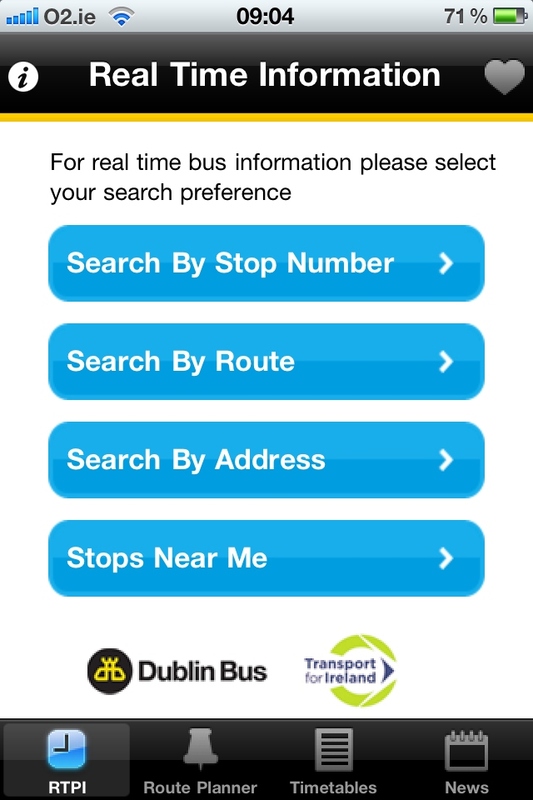 The Dublin Bus free app has gone a long way to eliminate all that. It doesn’t guarantee the buses will be every 10 mins but unlike the train table it’s not a static list of expected times it’s a list in real-time when your next bus will be at your stop. No more waiting and time-wasting. I can check the app in the office. Leg it out the door if a bus is a few minutes down the road or hang on and get some more work done if its 30 or 40 mins away. A more efficient use of my time. I am not getting frustrated with Dublin Bus, and I am missing a lot less trains. The buses are not running any more frequently, the traffic is not any better, it’s simply that I have real-time info to hand that helps me use my time better and lets me know when I can get a bus. I have added the 2 stops I use every day to favourites in the app and thus can jump in and out to check whenever I need. The app does so much more that I havent even explored as I haven’t had the need such as planning a route, searching for nearby stops based on GPS, searching for stops based on address, bus info based on route or stop number. I don’t need the latest shiniest phone. I can get it on the current models and there is a version for Android (or coming in November I believe). This is surely what mobile tech and apps are all about. Simple, practical real-time info that actually helps improve our everyday lives if even just a little bit. It’s very simple but for me it has been very very effective. So for this Dublin Bus I say thank you! ← Nike+ GPS for iPhone. Just Download it! Does the ingenious app come for blackberry too? I dont believe its available for the BB, it is (or will be) available for andriod devices…. Just another reason to buy an iPhone! She stems from a long line of ‘fey’ Scots and also telepathic capacity continues along with her very own children.